The Kremlin has a new weapon in its war on real or imagined enemies, from opponents at home to foreign revolutionaries. May 28, 2007 issue - The attacks came in waves, with military precision. Hours after Estonia removed a World War II statue of a Soviet soldier from downtown Tallinn last month, virtual war broke out. News agencies, banks and government offices were targeted in a blitzkrieg of spam—an onslaught of billions of e-mails, many apparently generated in Russia, that brought down servers and jammed bandwidths to bursting. As "eTonia's" famous digital-based free markets and democracy buckled under the strain, top NATO Internet security experts last week rushed to construct defenses against the world's first massive cyberstrike by a superpower on a tiny and almost defenseless neighbor. In Moscow, the attacks took a decidedly less modern cast. Activists from a Kremlin-created youth movement called Nashi stormed a press conference by Estonia's ambassador, retreating only after the diplomat's bodyguards sprayed them with Mace. Others blocked the birch-lined highway from Russia to Estonia with barriers and a large sign reading YOU ARE DRIVING TOWARD FASCIST ESTONIA. Russian President Vladimir Putin, meanwhile, commemorated the Soviet victory over Nazism with a massive military parade and dark warnings of "new threats" to world security, "as during the time of the Third Reich." The historical echoes are unsettling. Once again the Kremlin is on the offensive. And the shock troops in its war against Russia's enemies, real or imagined, is a new generation of impassioned young militants—the Communist Youth League, if you will, of Putin's Russia. They have names like Nashi, "Ours," or the Young Guard and Walking Together. Highly disciplined and lavishly sponsored by the Kremlin, these young ideologues came from nowhere a few years ago to number more than 100,000—a bona fide private army fanatically loyal to one man, the president, that denounces political opposition groups as traitors and fascists, demonizes foreign enemies from Estonia to Georgia to Poland and dedicates itself to the glorification of the Soviet Union and Russian power. "We need to make Russia strong again," says Nikolai Panchenko, a Nashi "commissar," or leader. (Yes, the old nomenclature has returned.) "It is time to put an end to America being the strongest and most influential empire. We won't let America make Russia another one of its colonies." Back in Russia's communist heyday, the Soviet youth group, Komsomol, sprang from the ruling party's obsession with "shaping the political consciousness" of a young generation. And so it is today. The Kremlin's drive to win—or control—the hearts and minds of Russia's youth took root in the aftermath of popular revolutions in Ukraine, Georgia and Kyrgyzstan in 2003-05. Realistically or not, many in the Kremlin worry that Russia might somehow be next. "The crucial role that young people played in those revolutions made us realize that something should be done," says Sergei Markov, a Kremlin-connected ideologue who helped found Nashi in 2004. "The plan was simple," he explains. "We launched Nashi in towns close to Moscow so that activists could arrive overnight on Red Square, if needed. The idea was to create an ideology based on a total devotion to the president and his course." With parliamentary and presidential elections coming up, Nashi and its sibling movements have an obvious target—anyone who presumes to challenge Putin and his ruling clique for power. Who might they be? Nashi recently issued a leaflet identifying them. This "Gallery of Traitors," appearing in print and online, featured twisted portraits of such opposition leaders as former prime minister Mikhail Kasyanov and radical writer Eduard Limonov. They were declared enemies of the people, scheming to subvert their nation and turn it over to foreign spies and conspirators. Among them, too, are exiled Yeltsin-era oligarch Boris Berezovsky and Mikhail Khodorkovsky, the former billionaire brought down after he began funding opposition to Putin in 2004. Last month Nashi staged its boldest and most organized mass rally yet. Some 15,000 volunteers donned red jackets, with putin's communicators emblazoned on the back, and spread out across Moscow distributing brochures and 10,000 specially made SIM cards for mobile phones. The cards allowed users to send text messages to the Kremlin—to be answered promptly by Nashi volunteers. Recipients were also instructed to use the cards to report any signs of an incipient Orange revolution. In that event, the cards would instantly relay text-message instructions on what to do and where to rally. "We explained to Muscovites that we should all be prepared for the pro-Western revolution, funded by America," says Nashi activist Tatyana Matiash, 22. "People must know what to do to save their motherland in case their radio and TV stop working." Not to be outdone by Nashi, the Chelyabinsk chapter of the Young Guards recently staged a training session in how to combat a possible Orange revolution in their city. A hundred volunteers with orange bandannas pretended to storm the local television station; Young Guards mobilized to defend it. The day ended with Guards wielding baseball bats to smash up an "Orange" tent camp, much like that erected on Maidan Square in Kiev two years ago. Last week in Sosnovy Bor, 120 kilometers from St. Petersburg on the Estonian border, Nashi volunteers toured village schools with a film entitled "Lessons in Courage." The movie opened with images of a vast Nashi meeting of youths in identical white T shirts, red stars on their chests, and continued with shots of Putin juxtaposed against photos of a noble-looking wolf, followed by images of rats symbolizing corrupt government bureaucrats. "Putin is a lonely wolf surrounded by rats," says Panchenko to the schoolchildren. "Russia has become too corrupt—it is time to change things, time for stronger leaders, like us." The paramilitary flavor is unmistakable. Every summer, Nashi runs recruiting camps all across Russia. New members watch propaganda films and receive basic military-style training, says Nashi boss Vasily Yakimenko. They are lectured by top bureaucrats and politicians, including Deputy Defense Minister Yury Baluyevsky and the thuggish Chechen President Ramzan Kadyrov—honored as a "Young Politician of the Year" at last year's Nashi congress. Activists who sign up a hundred new members qualify for promotion to commissar, so long as they pass a grueling three-day series of paramilitary assault courses and physical tests. "We had to demonstrate physical strength, endurance and team leadership," recalls Leonid Kurza, 23, the leader of the St. Petersburg chapter of Nashi, inducted last winter. Nashi also runs volunteer police troops, who wear black uniforms and, according to the movement's press service, "help police to patrol streets—and if necessary beat hooligans." Earlier this month Nashi's army staged a paramilitary exercise at a boot camp near Podolsk, 25 kilometers outside Moscow. About 50 activists in military fatigues marched in formation and ran obstacle courses. 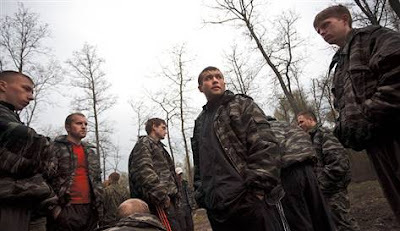 They practiced field-stripping Kalashnikov rifles and Makarov pistols, followed by an hour of target shooting. Less militaristic members can join a Nashi corps called SplaMeran abbreviation of "unification activities"—which offers psychology courses for team leaders. "We learned gestalt therapy and different methods of helping people relax and stay cheerful in the most severe conditions," says Matiash, a psychology student. "The enemy is using manipulation and provocations against us. We need to be ready to fight, shoot if we need to, to defend the principles of our current government." 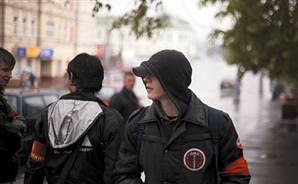 Veteran dissident Valeria Novodvorskaya likens Nashi to "a new Putin-jugend" modeled on the Hitler Youth. That's an overstatement. Nashi and other groups may be fanatically loyal to Putin, but their rhetoric and methods are more like a sinister parody of democracy movements in Ukraine and elsewhere. Much of their activity is orchestrated by Vladislav Surkov, Putin's right-hand man for political and media issues, who meets regularly with the groups' leaders to organize propaganda and political campaigns. The Kremlin is lavish with its funding, too, says analyst Ilya Ponamarov of the Institute of Globalization Studies, both in direct cash contributions and encouraging state-owned businesses to sponsor programs. The institute estimates that the "Putin's Communicators" campaign alone cost $220 million. And like the old Komsomol, the perks of membership are considerable. Members enjoy free admission to various schools of management, where they study government, business administration or public relations. They go on to allocated internships in top state enterprises such as Gazprom, Rosneft, state-owned television stations and even the Kremlin. Western leaders are growing increasingly alarmed at Russia's new direction. They have watched as it has retreated farther and farther from democracy under Putin's rule. They have been dismayed at the spectacle of thousands of riot police beating down small numbers of protesters mustered by the country's increasingly weakened political opposition parties. Last week U.S. Secretary of State Condoleezza Rice was in Moscow to take the temperature of relations, which have reached close to freezing. In his Victory Day speech Putin appeared to compare America to Nazi Germany, warning of the threats from countries with "contempt for human life and the same claims [as the Nazis] of exceptionality and diktat in the world." Putin has also vehemently denounced U.S. plans to station ABM missiles in Eastern Europe. "Everyone is frankly scared of the way which Russia is going, but no one knows what to do about it," says one European diplomat in Moscow, not authorized to speak on the record. With the Kremlin aggressively pursuing its enemies at home and abroad, and grooming a militant youth movement as de facto enforcers of its nationalist vision, Russia's neighbors are wondering with growing concern which of them could be next. Well, not so bad for Russia. After all, in future, such forces can be a part of organized revolutionary organization. Well, at least it's a matter of joy that "western democracy" haven't found proper root in Russia. The quicker it has been uprooted, the better for the future of Russia and the world.